For some reason this topic did not excite me. Which is weird because Christmas is far and away my favorite holiday. 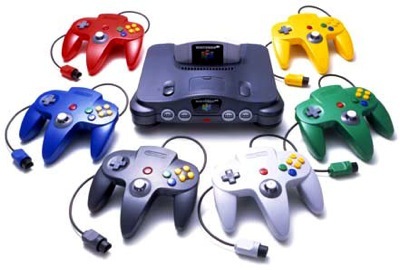 The only real topic I could think to write about was the christmas of ’96 also know as the Nintendo 64 christmas. The thing was I totally spoiled Christmas early that year. For whatever reason even at the age of 8 I had the foresight to pre-order what I knew was going to be a huge console release. Around comes September 29, 1996 and I knew my mom was out at the store picking up my brand spanking new Nintendo 64 and Mario 64. The following months were hard on my mother because I bugged the bejeezes out of her asking if I could open it early. It was just sitting somewhere in the house, not being played. A war crime punishable by death in some parts of the world. As the months leading to Christmas wore on, my mother’s patience wore thin. Finally, sometime in November, she caved. It was momentous. I was trembling opening that up. Unluckily for me I did not contain the knowledge I do now and had no idea what the new fangled red, white, and yellow plugs were. I was used to screwing something in the back of the TV and turning it to channel 3. I spent a while playing around to no avail. I eventually had to go buy an RF adapter. When I finally had it all set up, I flipped the switch. Instantly, I was inundated with what could only be described as the future. It was so fun. Even though it was before Christmas it was the best Christmas present I can remember. The most anticipated at least. This video was me in a nutshell. I remember when we got an N64 for Christmas. I don’t think our enthusiasm quite matched that of the boy in this video, but we were pretty excited. Previous PostPrevious On 12 Rhyming Couplets.